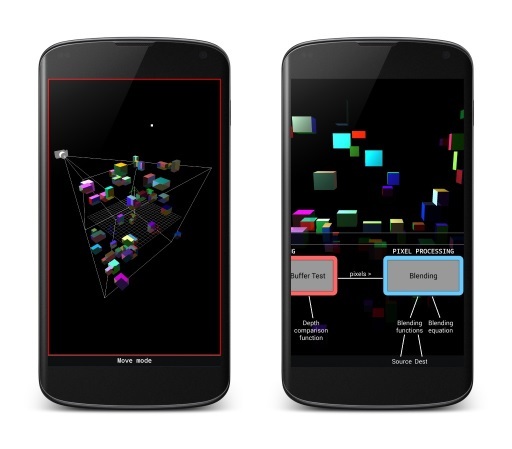 For a university project I designed, demonstrated, and analysed an educational mobile application. Its target audience is computer science students, and it can accompany a course textbook, allowing the user to visualise an arbitrary scene as each graphics pipeline step is applied. Interactivity with the simulated scene, and animated transitions, give the user immediate visual feedback on the state of the scene, which aids understanding. The pipeline simulator is a 3rd year project for the Computer Science course at the University of Oxford. It won the Gloucester Research Prize for best project in Computer Science 2014. The accompanying report can be downloaded in a compressed (1.8 MB) or full-size (4.9 MB) PDF. The source code for the simulator is available to view on Github. It is released under copyright © James Nicholls, University of Oxford. Please see the readme file for more licencing details.